The Shapale video is starting to conquer the rest of the world, my earlier blogpost has been translated into French and is published in the current issue of Courrier International! Unfortunately it’s only in print and not online but the whole print edition sounds really interesting, with other articles about Tibetan cultural output as well. 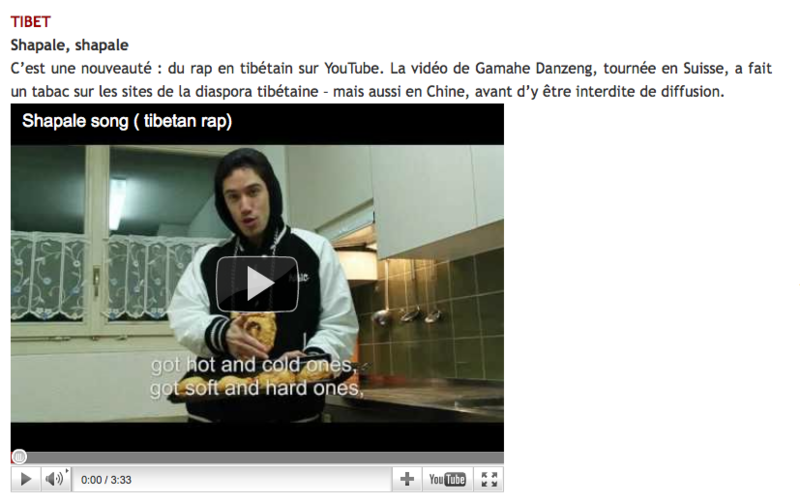 The Shapale video is on the Courrier International website here: http://www.courrierinternational.com/article/2011/06/08/a-voir-et-a-ecouter-2 Scroll down to the bottom to see it, you know you can’t watch it enough times! I had a fantastic trip to Warsaw last week and it might just be my new favourite city! My amazing hosts kept me busy but it was also fascinating, from well-organised speaking engagements to Georgian musicians on a river boat on an imaginary Caucasian passport, I enjoyed every minute! Thank you to Piotr and Bartek and also PolishPEN, hope to see you again soon! It’s so exciting to see young Tibetans in exile taking the initiative in an original and creative way to support the Lhakar (White Wednesday) movement that is taking place in Tibet right now. Every Wednesday, a group of young Tibetans from USA, Canada, UK, India and beyond will be writing blogposts, making videos, basically documenting how they are asserting their Tibetan identity in their everyday lives. There is already an interesting post about Tibetan literature and a video on how to make Shapaley. To see a project that involves young Tibetans thinking, writing, exploring their creativity and using the internet to express themselves is incredible and I look forward to every Lhakar from now to check up on how they are doing.